As a child, my siblings and I grew up with a boxer named Gunnar. His mission was to escape from the house and have all the kids in the neighborhood chase him for hours. Everyone in town knew Gunnar! Throughout my entire adult life, I have always had a pet dog. Shelly, the black lab, was my first dog I owned. Then came along Bailey, the yellow lab, Hunter, the red golden retriever, and Caspar, the English cream golden retriever. After Hunter passed in December 2014, I reminisced about Gunnar and decided to research adopting a boxer. Tebow was born in Ohio on November 28, 2014 along with his two sisters, Gina and Sabrina. 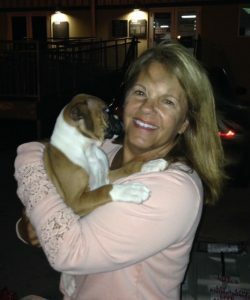 Since puppies can’t leave their Mom until they are eight weeks old, Tebow was flown into Tampa Airport Cargo Hold on January 23, 2015. When I held Tebow for the first time, I knew it was PUPPY LOVE AT FIRST SIGHT. Like humans, all dogs have their own unique character traits that go with their type of breed too. Tebow’s enthusiastic sporty charm shined through right away. Caspar seemed excited to have a new buddy. 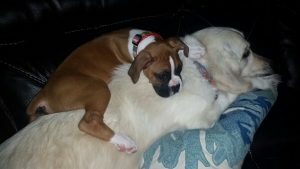 Tebow, is a spunky boxer, and Caspar, is a shy golden retriever. Tebow adapted to living on the water right away, and jumped on the boat and jet ski on his own will. Like golden retrievers, boxers are loyal, fun-loving and extremely good with children of all ages ready to join in any game with gusto. Boxers grow older but they behave like life long puppies. As I observed Tebow’s zany energetic charm, I became inspired to write the adventures of Tebow and wrote “TEBOW TAILS~Caspar’s Conquest”. All of the dogs in TEBOW TAILS were real puppies and were wonderful pets beloved by their families. Just like best friends, all of the pups in TEBOW TAILS have the common bond of loyalty, intelligence, playfulness and humor. I think one of the pure joy’s in life is the unconditional love from our adorable puppies who we bond with and become each other’s trusted friend. We can ALL learn a thing or two from our pups. Please share your favorite PUPPY PIC. You know we will ALL have PUPPY LOVE AT FIRST SIGHT.